Thank you for stopping at my spot on Overdue For Murder. 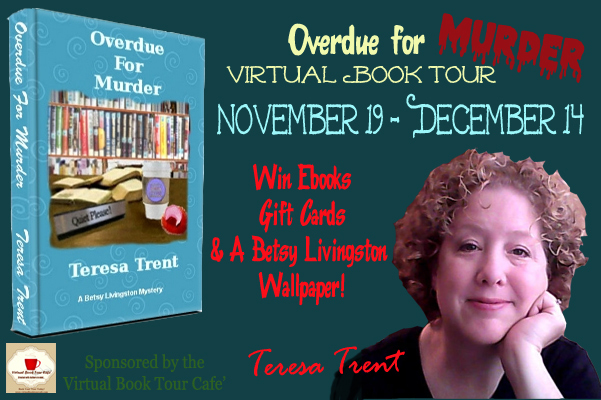 This Virtual Book Tour is brought to you by Virtual Book Tour Cafe. 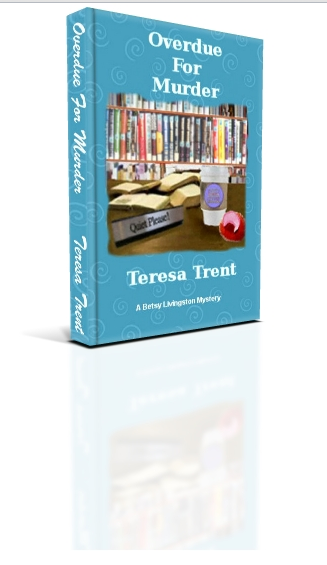 I will provide you with a synopsis of the book, review, and a small bio from Teresa Trent. Visit the other blogs on this Book Tour to learn more about this book. “Like what? Like what you see at the grocery?” Maggie’s voice rose at the end, exaggerating her Texas accent. I propped up the book for her to see a cake titled “Undersea Fantasy,” which featured crabs, turtles and dolphins all crafted out of what looked like marshmallows and licorice strings. She peered at it, adjusting her bifocals on her nose as I explained to her what Rocky had asked me to do for Creative Cooks Day. “What world record?” Maggie asked. “All of them!” Danny answered. “Thanks for the warning,” she smiled. “You could make a cake out of rubber bands,” suggested Zach. I nodded. “That’s original, but not too tasty.” I turned the page and spotted the cake labeled “Beginner’s Crocodile Cake.” How kind of them to have a cake that was supposed to be easy enough for people like me. I grabbed a pen and started writing down the ingredients I would need. Surely I could stir up some green frosting and turn it into something. Teresa Trent wasn’t born in Texas but after a few glasses of sweet tea and some exceptional barbecue she decided to stay. With a father in the Army, she found herself moved all over the world, settling down for a while in her teens in the state of Colorado. Her writing was influenced by all of the interesting people she found in small towns and the sense of family that seemed to be woven through them all. Teresa is a former high school teacher and received her degree from The University of Northern Colorado. 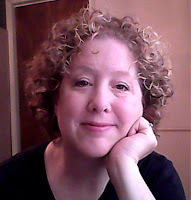 Teresa is presently working on the third book in her Pecan Bayou Series. Her second book, Overdue For Murder, came out in June of 2012. I read another book by Teresa Trent, A Dash of Murder and really liked it so I could not wait to read Overdue for Murder. I was not disappointed I liked Overdue for Murder as much as her last book. The author is good at making the characters real and there day to day life just like yours or mine. 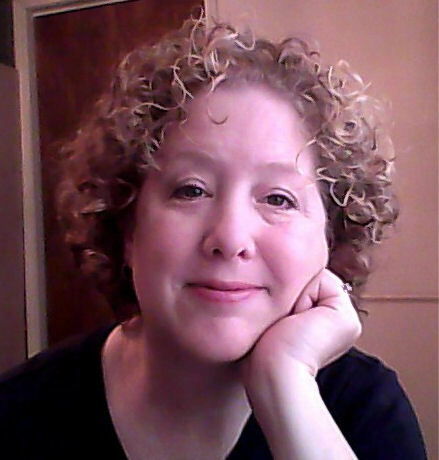 Besty Livingston is a single mother who writes a weekly hints column for the local paper. She also recently had a book published. Which is why she is at the library with other local authors giving a short synopsis of her book. This is were she stumbles on the body of one of the other authors Vanessa in one of the rooms of the library. Poor Besty is standing with the candlestick in her when the others enter the room. Was Besty framed or did she kill Vanessa? Who could have done it? Besty will need to try and find out who the killer is before she is convicted of murder. I think everyone will enjoy this book and want to read it till the end – because it will take that long to figure out who the murder is. I can’t wait till Teresa Trent has another book in this series. Make sure you stop at some of these other stops on the tour.